Our Signature Superfood – The World's First Frozen Algae! Shipping charges will be added during checkout. E3Live® Original is 100% guaranteed. Consume 1 tbsp. or more daily. Keep frozen until ready to use, then place bottle in refrigerator to partially defrost. For immediate use, place frozen bottle in cool water for 15 minutes, then pour ¼ off and pour into separate container to put in the fridge. Place the remaining frozen portion (still in the original bottle) back in the freezer. For maximum results and benefits, use 1 bottle per week. When defrosted, E3Live® Original must be kept cold and refrigerated. Shelf life in the refrigerator is 7-10 days. Frozen Singles: for a hassle free experience, remove the individual frozen serving of E3Live from its packaging while it's still frozen. You can then add the frozen single to your smoothie or other beverage, or place it alone in a glass to thaw if you prefer it as a shot. E3Live is 100% Aphanizomenon flos-aquae blue-green algae (AFA for short)—a certified organic wild-harvested Nutrient Dense AquaBotanical™ considered by renowned health authorities to be nature's most beneficial superfood. Our E3Live AFA is a non-GMO Heirloom variety. E3Live is the frozen/liquid form of AFA, which is superior to all other forms of AFA. E3Live is the only company to offer AFA in this fresh-frozen form. Nutritionally, E3Live provides over 65 vitamins, minerals, amino acids and essential fatty acids. ** It is the most nutrient dense food known to mankind. * E3Live is a gift of nature, a miracle food. E3Live - We warmly invite you to experience this gift of nature, this certified organic nutrient dense superfood. Get the benefits of E3Live now. 100% Aphanizomenon flos-aquae, a Nutrient Dense Aqua Botanical (blue-green algae). E3Live (Aphanizomenon flos-aquae) is wild-harvested from Upper Klamath Lake, Oregon, USA. E3Live is tested and assayed for purity. Please browse this website for Research Information about E3Live and Lifestyle Resources for making plan for better health as well as scrolling to the bottom of each product page to learn more with our FAQs. To ensure E3Live® Original arrives in its freshest state, we ship in quantities of 6 or more — we've found a minimum of 6 bottles keeps your E3Live® Original optimally cold during transit to your door. Here is a simple, refreshing drink to replenish your body throughout the day! Juice the cucumbers, add the juice of the lemon and the E3Live & enjoy! E3Live—the world's first frozen algae. E3Live is 100% Aphanizomenon flos-aquae (AFA). It's a nutrient-dense aqua botanical that's certified organic and wild harvested. 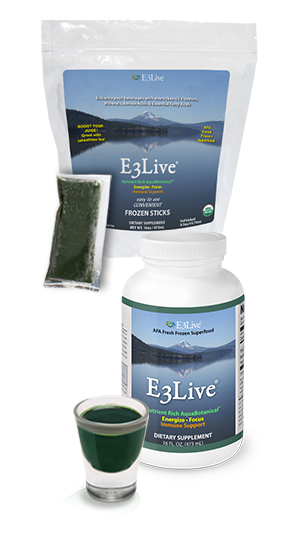 E3Live is fresh-frozen AFA (blue green algae) that is live, liquid, and closest to its natural state. Dr. Brian Clement, PhD, LNC Director of Hippocrates Health Institute says "E3Live is beyond a superfood—it's the food of the future. E3Live constantly puts me in a state of awe." Dr. Gabriel Cousens, M.D. M.D. (H), D.D. Director of Tree of Life Rejuvenation Center says "E3Live helps to restore overall biochemical balance by nourishing the body at the cellular level. I take it myself daily." We are the harvesters of E3Live from the mineral rich waters of Upper Klamath Lake, Oregon on the Pacific Ring of Fire. Harvesting E3Live is an art and a science. Delivering E3Live with the highest quality and purity standards is #1 on our list. We meet and exceed all standards set forth by the FDA and Department of Agriculture Food and Safety Divisions. We care about the safety and efficacy of our wild-crafted AFA. E3Live considered by renowned health authorities to be nature's most beneficial superfood! Great product! Im taking some first thing in the morning. Rhonda Brown really knows the product and process. She offers extraordinary customer service. E3Live is a great product! I use the original fresh frozen product daily, and it has made a difference in my energy levels, hair and nail growth, vitality and general overall health. I feel better than I have in years! While others around me have fallen ill in the cold and flu season, I did not. I believe my immunity has been zooped up since using E3Live. Seriously, I recommend this to everyone! i do not miss a day of using E3Live, it's that important. I love adding E3Live to my daily green juice - it really helps me start the day out right! I am on my second round of 6 bottles. I felt an increase in energy with the first 6 bottles. I was out for a 2-3 weeks and began to feel punk. Now I am almost done with my second 6 bottles and not feeling any better. I am going to try 6 bottles of this product that contains the BrainOn. We will see. I used 6 bottles of 8 oz for 4 weeks. At the 4 week mark, I began to feel an increase in energy. I finised the 6 bottles. After being out for 2 or 3 weeks, I felt sluggish. I ordered more! Love how it makes me feel, my digestion has significantly improved. Ships fast in only 3 days @ didnt wait to take it. Can E3Live frozen products vary in color from bottle to bottle? As a wild-grown food, E3Live naturally responds to variations in the weather. Different harvests yield E3Live with higher amounts of chlorophyll or carotenoids or essential fatty acids. E3Live with more of the blue color have more phycocyanin. Other times when E3Live is more brown in color, it has more of the carotenoids than the chlorophyll. Different harvests of this superfood naturally vary in color, smell and taste because of ever-changing day-to-day shifts in weather, sunlight, temperature of water, temperature of air, etc. This natural ebb and flow is all part of the beauty of wild-harvesting this vital aquabotanical. We ensure that every year, with every harvest, we offer the highest quality 100% AFA. Can I feed AFA to my pets? Absolutely, in fact, both the liquid E3Live and our E3AFA dried form are favorites among veterinarians who successfully treat nutritional deficiencies in dogs, cats, birds, reptiles, horses, and other animals. Benefits are especially seen in older animals, bringing back youthfulness and a higher quality of life. We carry E3 Canine and E3 Feline especially for dogs or cats of all ages. Horse owners love E3Live for the changes seen in hooves, coats and the overall health of their horses. If you love your pet, you'll love E3Live. There is no other pet food that dares to give an unconditional one-year guarantee that you will "See the Difference!" Read about other pet owner's experiences with E3Live in our Testimonials section. How are E3Live's harvesting & filtering methods superior? E3Live's superior harvesting and proprietary filtration methods ensure the absolute highest quality. Our AFA is selectively harvested so that only the purest, most vibrant blooms are gathered. Starting at our harvest site, E3Live is immediately chilled to preserve its natural vitality and highest nutritional value. We work hand-in-hand with the most experienced, conscientious harvesters and knowledgeable researchers in the world. For more information see our Harvesting page. How can E3Live Frozen Products help with my specific medical condition? 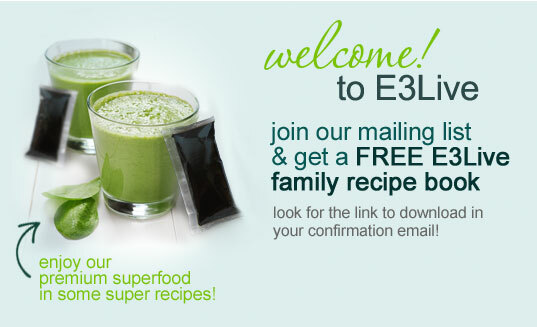 E3Live Frozen Products are considered nutrient-dense superfoods. You can consult with your healthcare professional prior to consuming E3Live Frozen Products or any E3Live products if you have any concerns regarding your health or a specific medical condition. How do E3Live & E3AFA work? Artificial supplement and drugs are synthesized in the laboratory to produce specific effects on targeted cells, organs, or body functions. Nature's innate wisdom works through AFA's full spectrum of over 65 perfectly balanced, naturally occurring vitamins, minerals, amino acids (protein) and essential fatty acids. ** AFA helps restore overall biological balance and nourishes the body at the cellular level. E3Live frozen products are believed to be 97% absorbable by the body, compared to man-made vitamins, which may only be 5% to 25% absorbable. * Without any toxicity or side-effects, this is how E3Live and E3AFA can have so many beneficial nutritional and energetic effects throughout the body. How is E3Live different from other brands of AFA from Klamath Lake? E3Live is the only AFA that is live, liquid and delivered to you closest to its natural state. E3Live is selectively gathered by our expert harvesters, and collected from only the deepest, most pristine waters of Upper Klamath Lake. We harvest only at peak times of optimal growth, when the AFA is the heartiest, healthiest and most vibrant. Harvesting AFA is an art AND a science. We discovered that the strongest and freshest AFA possesses the highest life-force. The benefits of AFA are directly proportional to the quality of the harvesting source, and how the AFA is handled at every step of the process. We take pride in knowing that we bring you the most potent and powerful AFA in the world. I accidentally thawed the whole bottle of my frozen E3Live product - what do I do now? If you defrosted the bottle of E3Live frozen product in your refrigerator or in a cool bowl of water, and it hasn't been thawed for more than a few hours, it should be fine. Just pour off the portion for the week that you need, then, refreeze the rest. Alternately you can pour off your week's worth, then make single-serving E3Live frozen product ice cubes by pouring into ice cube trays that have resalable lids (to keep freezer odors out). Add the single serving cube to your water or juice as your daily serving of E3Live frozen product. If I take E3Live or E3RenewMe! Total Body Blend, do I have to continue to take my multi-vitamin? E3Live provides over 65 easily absorbed vitamins, minerals, essential fatty acids and amino acids. ** Many people take just E3Live while others will take additional supplements. E3RenewMe! Total Body Blend contains E3AFA and other nutrient-dense superfoods. If you are not certain please consult a nutritional or medical professional. Is E3Live Kosher certified for Passover? Yes we have E3Live products that are Kosher certified for Passover, including the following: E3AFA Flakes and Powders, E3Live Fresh Frozen AFA, BrainON Flakes, Frozen and Powder. For more details contact us at Sales@E3Live.com. It's fresh frozen, as close to its living state as possible. What's the difference between E3Live and E3AFA? Both are 100% Aphanizomenon flos-aquae (AFA) a freshwater plant harvested from Klamath Lake in Oregon. E3Live is the frozen/liquid form of the AFA, which is superior to all other forms of AFA. E3Live is the only company to offer AFA in this fresh frozen form. E3AFA is the Hydro•Dri™ dried form of the AFA, which comes as either vegetarian capsules or loose powder. Both are excellent foods. E3Live's live liquid form is closest to its natural high-energy state found in nature and is the ideal way to consume AFA. Our Hydro•Dri™ drying method retains much of AFA's original nutritional and energetic properties. We recommend our Hydro•Dri™ dried E3AFA to further boost nutritional intake, as well as for your convenience at work and while traveling if refrigeration is not available. This same answer applies to fresh-frozen E3Live + BrainON products vs dry BrainON products. What's the difference between E3Live and man-made nutritional supplements? E3Live is a whole, organic freshwater plant found in the wild that has both discovered and undiscovered nutrients. It is fresh-frozen - live, liquid and closest to its natural state. * This means that nutrients are easily absorbed and assimilated – bio-available for the body to use. Only a fraction of the nutrients from processed, man-made nutritional supplements are actually absorbed by the body. When (after eating E3Live and E3AFA) will I notice a difference? The beneficial effects of E3Live and E3AFA in your body can be subtle as it works to provide long-term protection and well-being. Some people may experience noticeable changes within a few weeks of use - others may notice differences right away or, conversely, notice little or no effect whatsoever. It is important to maintain a healthy diet and exercise regularly in order to reap the full, long-term benefits of AFA. And, while the benefits of consuming AFA may not always be visibly manifested, be assured its phyto-nutrients are working "behind the scenes" throughout your body's internal systems. When is the best time to take E3Live frozen products? For optimal results, we recommend that you take E3Live frozen products first thing in the morning on an empty stomach. Why can you thaw and refreeze E3Live whereas you can't with fruits, veggies, and meat? The reason that our frozen products can be thawed and refrozen is because AFA is a single cell organism. When AFA is originally frozen, the cells are broken and the nutrients are released. Fruits, veggies, and meat are multi cellular and each time they are thawed and refrozen the process breaks down more and more cells, causing noticeable degradation of the meat and produce. AFA can not be broken down any further, however like any other organic material AFA still does degrade further after a period of time in the refrigerator. Why is it when E3Live is poured through a cheesecloth it appears to be mostly water? We never add water to E3Live. E3Live is a 'whole living algae' harvested from the lake. Algae cells are 92% water as nature has made them. Inside the algae cell walls are all of the vitamins, minerals, amino acids and essential fatty acids, chlorophyll and phyto compounds. When algae is frozen, the cell walls burst open and then separate from the liquid. If you were to drip the E3Live through a cheesecloth, the solids that you see in the cheesecloth are those cell walls.